I have had this recipe for some time and sorta resisted trying them. I tried them last night and let me tell you they were very very good! They had a mild chewiness – I did not add rains to half of this batch and both were very good! You would think since these are made with banana that it would taste like banana – but it only carried a minor flavor of banana. You can make them with whole milk instead of almond milk and you can cut the cinnamon in half or eliminate it all together. I added 1/4 cup dark chocolate chips to half this recipe and they came out perfect. 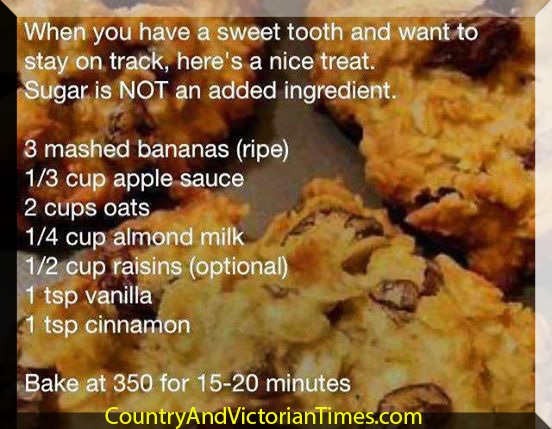 I imagine you could substitute all or part of the raisins with chopped nut or dried cranberries. I highly recommend this recipe! This entry was posted in Health & Medical, Recipes, ~Breakfast, ~Dessert, ~Dieting, ~Healthy, ~Holiday, ~Party, ~Snack and tagged almond, alond milk, apple, apple sauce, Banana, bananas, chips, chocolate, chocolate chips, cinnamon, cranberries, Diet, milk, nuts, oats, raisins, sauce, vanilla, ~Healthy. Bookmark the permalink.